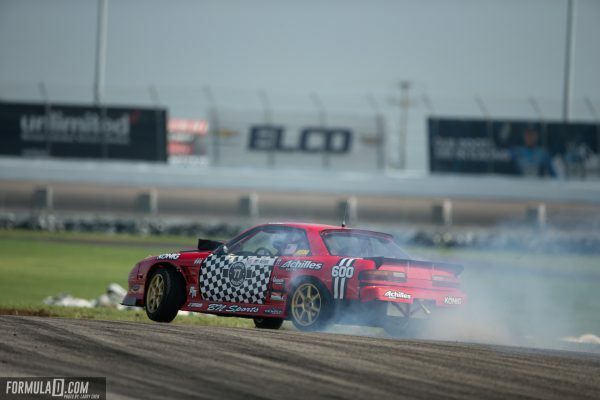 Travis Reeder really put on a display this weekend in Pro 2 with his 240sx. He handled and attacked this track better than a handful of the guys in the Pro circuit. He is a prime candidate to promote himself into the Pro series for 2019. With his victory this weekend he is now tied as the second most winning Pro 2 driver in history. If he can scrape out another win in Texas or Irwindale, he will be tied with Kevin Lawrence for the most Pro 2 wins in history. Matt Field had some early season hiccups in the Corvette that has hurt him in the bigger picture of the championship this season. That is a bummer because Texas and Irwindale tend to be strong tracks for him. The jump into a Corvette was a bold one for his team but it really paid off. He is growing season by season and constantly pushing himself to be better. You can see this clearly in his Frenemies series that gives you some insight into his program. Dean Kearney was rumored to be retiring the Dodge Viper this season but I am glad he is still kicking in the V10 monster. His chase run won’t be remembered by most since it was in the Top 32, but man he pushed Piotr Wiecek into a wild battle. Dean’s performances are just cluttered up with a bit too much inconsistency to make him a real championship threat but he could clean that up at anytime. What a performance Chelsea DeNofa put on this weekend at Gateway Motorsports Park. His second qualifying run was one of the most memorable events of the entire weekend along with his aggressive tandem chase positions. He is perfecting the driving on the edge style without smashing into people; and if he can make that a little better, he could become the most memorable drifter in world history. His podium was a huge step for his new life in a Mustang. The battle for keeping your engines together was a tough one over this race weekend. The outside temps sat around 90 degrees for the race weekend but that combination with the long on throttle portions of the track made for engine soup. Taylor Hull missed competition entirely with an engine while many of the big teams were forced on Thursday night to go to back up engines. Chris Forsberg limped his backup motor to a Great 8 finish while it was on the verge of an explosion and James Deane lost his motor and 50 points in the championship chase for a mechanical issue with his 2JZ engine. 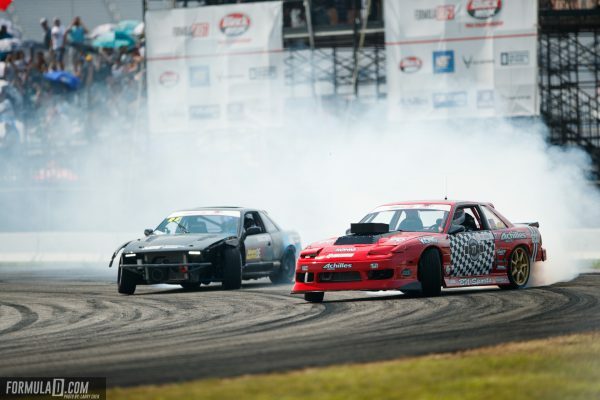 These two S15’s are indestructible in Formula Drift until they battle each other! The sport is on pins and needles waiting and hoping for a Worthhouse tandem battle that goes the distance with these two banging doors around the course straight up. I feel like Texas or Irwindale might deliver the goods for the fans out there so stay tuned. 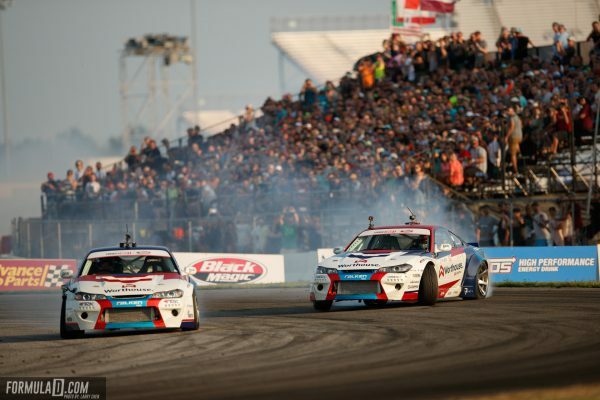 Ken Gushi is a driver that fades in and out of the spotlight in Formula Drift with his Toyota 86. The car seems plagued by car issues and sometimes Ken Gushi doesn’t quite seem on point. When he is on point though, he can light the drifting world on fire with a great performance. Inside his interview with Corey Hosford he did make it very clear he loved this track and you saw it in his tandem battles. He qualified 3rd, earned a bye run, then made easy work of Kristaps Bluss, and went down fighting against Chelsea DeNofa in the Great 8 before taking a loss. He tends to do well at Texas Motor Speedway as well so he could be a championship upset for one of the guys left in the race. The Pro 2 championship is going to deliver another wild finish it appears. Travis Reeder and Dylan Hughes sit within 1 point of each other with just two rounds left in the series. 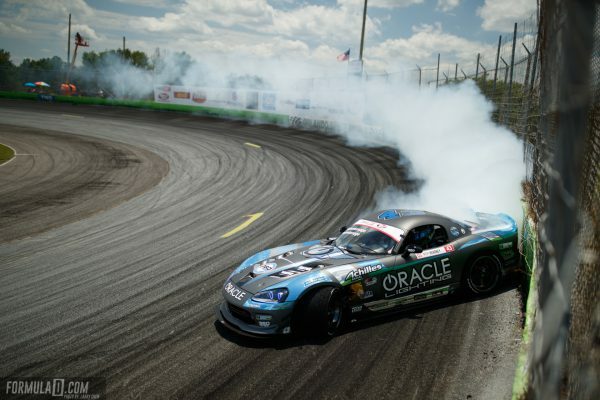 I also wouldn’t rule out Ola Jaeger who won Round 1 but had some car issues in St. Louis that really held him back. If the Pro showdown between Aasbo and Deane doesn’t get you excited then the Pro 2 championship is something to keep your eyes on. The Championship last season was won by just two points so don’t miss either of the next two Pro 2 events. Fredric Aasbo has become a new driver before our eyes this season. He has a very no nonsense attitude in his drifting and I love it personally. He was run into, bumped, and had his door smashed in but nobody was going to put him off. To make the championship interesting, Fredric Aasbo needed a win and he did exactly that. 30 Championship points now separates him and James Deane as they go into Texas Motor Speedway. James Deane did win at Texas Motor Speedway last season so Fredric Aasbo will have some extra work ahead of himself. The true hope all the fans likely have is they can meet up and battle early into the Texas weekend and leave it all out for an Irwindale final to remember.